VW, Ford team up on trucks, eye deals on EVs, self-driving cars - SABC News - Breaking news, special reports, world, business, sport coverage of all South African current events. Africa's news leader. Ford and VW announced their partnership against the backdrop of the Detroit auto show. The tie-up, which starts with sales of vans and medium-sized pickups in 2022, will not involve a mergeror equity stakes, the companies said. “You can’t do this alone,” Ford’s chief executive, JimHackett, said on the call. 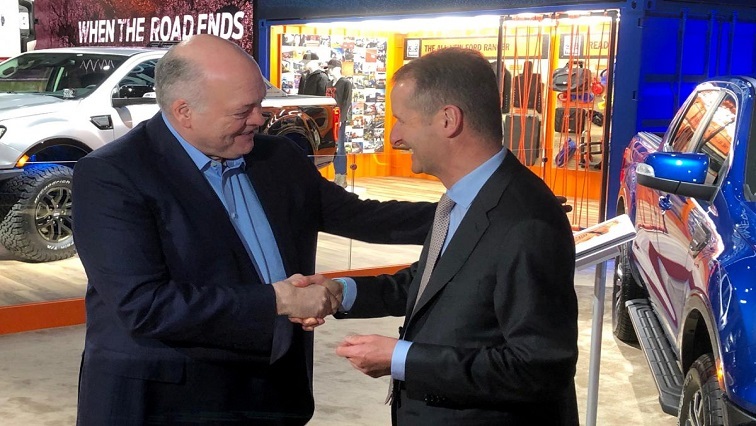 Ford will provide more details on how the alliance affects Ford’s regional operations in coming weeks, but does not expectancy job cuts in its plants as a result of the alliance, he said. Ford and VW have signed a memorandum of understanding to jointly develop electric and self-driving vehicles, Diess said. Both executives said they were optimistic those deals would befinalized but provided no timeline. Sources previously said the framework of such a deal wouldinclude VW investing in Ford’s autonomous vehicle operations, including its Argo AI business. VW shares were up 0.7% at 145.08 euros in Frankfurton Tuesday. Ford shares were down 2.7 % at $8.75 on theNew York Stock Exchange in late morning. “Automakers aren’t just competing with each other anymore, they’re under intense pressure from well-funded tech companies, “said Jessica Caldwell, executive director of industry analysis at Edmunds. Europe’s biggest automaker and the No. 2 U.S. automaker have been exploring closer cooperation as trade frictions force carmakers to rethink where they build vehicles for Europe, the United States and China. Slowdowns in the world’s largest auto markets – China and the United States – have ratcheted up the pressure to cut costs. The tie-up with Volkswagen is a big bet for Ford’s Hackettsince he took over in May 2017 from the ousted Mark Fields with the mandate to speed up decision-making and cut costs. Some analysts and investors have been frustrated by Ford’s laggardstock price and a perceived lack of details from Hackett about the Dearborn, Michigan-based automaker’s $11 billion restructuring. Last week, Ford said it would cut thousands of jobs, discontinue building money-losing vehicles and look at closing plants as part of a turnaround effort for its unprofitable European business. Ford’s president of global markets, JimFarley, said on the conference call that the company will do “whatever it takes” to get Europe back to profitability. Last month, Volkswagen announced another 3 billion euros($3.4 billion) of cost cuts as part of its effort to improve profit margins and fund its shift to electric cars and automated driving. This entry was posted on 16 Jan 2019,07:51AM at 7:51 AM and is filed under Business, Homepage Featured Story Slider. You can follow any responses to this entry through the RSS 2.0 feed. Both comments and pings are currently closed.